Grilling delicious food is something that goes hand in hand with the summer months. From chicken to hot dogs to that amazing burger, nothing screams “summer” like BBQing with friends and family. Regardless of the type of grills or cooking methods you use, if you’re looking for flavor, then nothing stands a chance against the charcoal grill. Sure, there’s gas and electric grills and they do a great job as they’re convenient and they have their own set of benefits, but those that have flavor on their mind have a tendency to stick with the popular charcoal grills.The smoky taste that charcoal grilling offers is one of the biggest reason so many people go with charcoal grills over the other grilling options. The heat and smoke that are produced by the burning charcoal creates juicy meats that are out of this world. 1 Why Choose a Charcoal Grill? They Get Hot – Charcoal grills have a tendency to be able to reach higher temperatures than electric and gas grills. This way, the meat will be crisp on the outside, but once you cut into it, it’ll be juicy and flavorful. They’re Portable and Affordable – If you’re looking for a good backyard grill that is affordable, then the charcoal grill would be your best bet. They’re Traditional – If you grew up eating steaks and burgers that were made on a charcoal grill, then chances are, this is a tradition you will want to stick with. You probably didn’t expect to see a “trashcan” cooker on this list, but here it is. Don’t worry, if you have this grill in your possession, it doesn’t mean you’re poor. It just means you have a good sense of humor, and people around you are going to appreciate this. 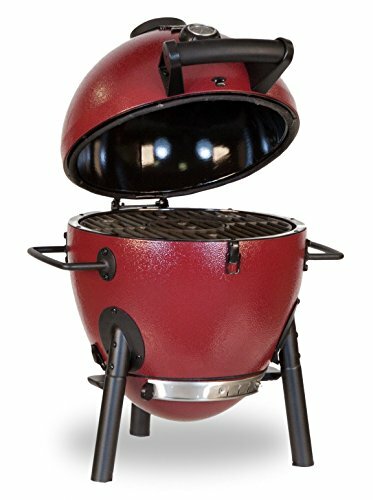 This is an interesting charcoal grill that has one round grate, 2 skewers and a flavor lock drip-plate. If you’re looking for a grill that is going to be the talk of your next cookout, then this one right here will do the trick. 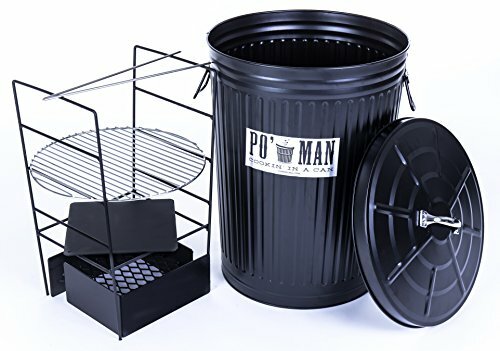 Seriously, based on many user reviews, Original Po’ Man Charcoal Grill is capable of out-cooking many of the other expensive grills currently on the market. This grill is capable of providing more flavor, more value and can cook lots of meat. We really like how it’s portable. All you have to do is take it out and set it up (setting it up is simple). It is cheap to operate because all you need is plain charcoal and some lighter fluid to get it going. If flavor is something you’re concerned with (we don’t blame you on that one), then you’re in luck, because this Po Man grill has a patented design for maximum flavor. We’re sure you’ve noticed that this looks like a trash can, but it cooks some amazing tasting food and is a great way to get in touch with your inner country boy and uppity connoisseur both at the same time. All you have to do is add some charcoal, light those coals, add the meat, tilt the lid and you’re good to go – from there, it’s all on autopilot. This gives you more time for hunting, golfing, fishing, swimming or whatever it is you like to do at your cookouts. We cannot leave out the fact that this grill is made of highly durable rolled steel and stainless metals. It’s painted with high-temperature bbq paints, so you don’t have to worry about that. It is not galvanized. 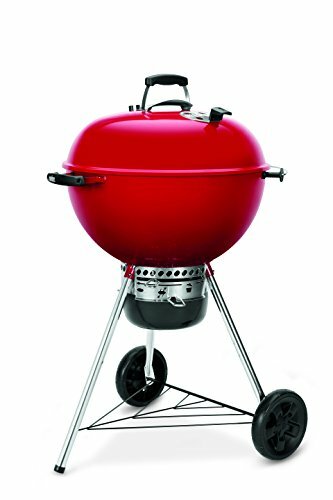 Next on the list, we have the Weber Original Kettle Premium Charcoal Grill. It features a nice 363 square-inch cooking space and has a lid and bowl that is porcelain-enabled for long grill life and durability. When you are trying to cook amazing tasting food for everyone, being able to control the temperature is needed. With the Weber Original Kettle Premium Charcoal Grill, you can control the temperature without even having to lift the lid. All you have to do is adjust the dampers. By closing the dampers, you’ll be eliminating the flow of oxygen, which is going to extinguish the coals. Speaking in being able to control the temperature, this grill is capable of withstanding high temperatures. You can arrange the charcoal on the grade for either indirect or direct grilling. The cooking grate retains heat and is hinged so that you can easily add more charcoal while you’re grilling. We really like the lid placement on this grill because it is super convenient. It has an angled lid hook that makes it so that you can hang the lid on the side of the grill so that you don’t have to place it on the ground. There are also hooks so that you can hang those grilling tools like tongs and spatulas in order to easily access them and stay organized. If you want to move your grill around, then that’s perfectly fine because the durable wheels make this possible. There’s a heat shield that helps prevent the handle of the lid getting too hot. When it’s all said and done, you will need to clean your grill. The good thing about this grill is that it is easy to clean. There’s a one-touch cleaning system that makes it easy to clean up the charcoal ash. Here is another grill for under $200 that might just be suitable for you. 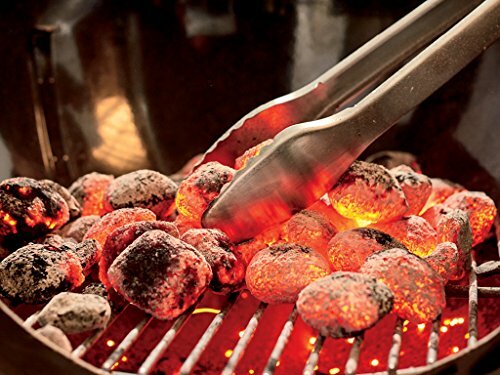 With the Char-Griller Akorn Jr. Kamado Kooker Charcoal Grill, you will be able to enjoy Kamado style cooking. A kamado grill is one of the best ways to serve different types of dishes, and there are many benefits to using one. This grill is obviously built to last with its triple walled 22 gauge steel. It features an exterior finish that is powder coated, and a porcelain coated steel interior finish. There’s also a 153 square inch cast iron cooking surface, built-in temperature gauge and a dump ash pan. Due to the fact that it’s made out of high-quality material, the Kamado Kooker charcoal grill won’t have a problem maintaining cooking temperatures. It is capable of maintaining temperatures that range from 200 to 700 degrees Fahrenheit. While it’s easy to maintain cooking temperatures, it’s also easy to control the temperature. The top and bottom dampers are adjustable, so you will be able to maintain even air flow throughout the grill while it’s smoking or cooking. The Kamado design is fuel efficient, which means you don’t have to use a whole lot of charcoal while you’re cooking. If you’re looking for a grill that offers more than enough room for grilling at the park, during a tailgating party, while you’re camping or in your backyard, then this is the grill for you. It features 153 square inches of cast iron grill space. The Char-Broil TRU-Infrared Kettleman Charcoal grill is something we just couldn’t leave off of this list. If you’re looking for the ultimate backyard barbeque grill, then this one right here might just be a suitable option for you. It features 360 square inches of cooking space on its rust-resistant, porcelain-coated cooking grate. This is a no-fall-through cooking grate, so the food will stay on top, just as it’s meant to be. What’s really neat about this grill is the fact that it has a hinged lid. The lid props open so that you can work with the food and charcoal using both hands. There’s no need to have to put the lid on the ground or hang it on the side. The cooking system makes it so that the food evenly cooks and there’s greater temperature control. The infrared heat will help prevent cold and hot spots on the surface of the grill – this also facilitates faster cooking. It also creates a barrier between the flames and food, which means, flare-ups are non-existent, so you will have more flavorful food each time you use the grill. The large adjustable damper makes it so that you can let heat out. When you close it, you will be increasing the temperature. The no-fall-through cooking grate is a big hit. The grate makes sure your food stays on top, and it evenly distributes heat. There are air inlets surrounding the perimeter of the grill. These inlets help increase air flow, which makes it so that there’s even heating. There’s a temperature gauge located on the lid. This makes it so that you can keep track of the temperature inside the grill. If you’re searching for a charcoal grill to fit in a limited space, then you may want to consider the Char-Griller Patio Grill. It is constructed of heavy steel and has a cast iron gate. 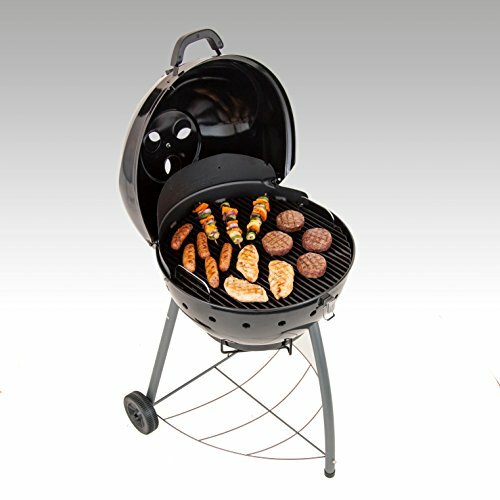 It offers 250 square inches of grilling space, which is perfect for most grilling needs. The patio pro is seriously built to last. It’s made from heavy-duty steel and powder coated material and the grill itself is made of cast iron, so you can rest with the satisfaction of knowing there is going to be a lovely sear to your food. Did we mention it’s compact? It only weighs 50 pounds and it has wheels, so it’s easy to move around the patio. It’s 31 inches wide by 21 inches deep and stands up at 44 inches. When it’s all said and done, you want something that is easy to clean up. Don’t worry, because this grill comes with a dump ash pan, making it easy to get rid of the ash. There’s no need to tip over the grill or anything like that. All you have to do is pull the pan out and dump the ash. Let’s say you have more hamburgers made than will actually fit on the grill. That’s not a problem. There’s a tray located on the side shelf, so you can store those burgers until you have more room to put them on the grill. If you’re looking for a place to put that bag of charcoal – take a look under the grill – there’s a storage rack under there where you can place that bag. If you’re searching for a good foldable grill, then this next one is something you’re going to want to pay attention to. 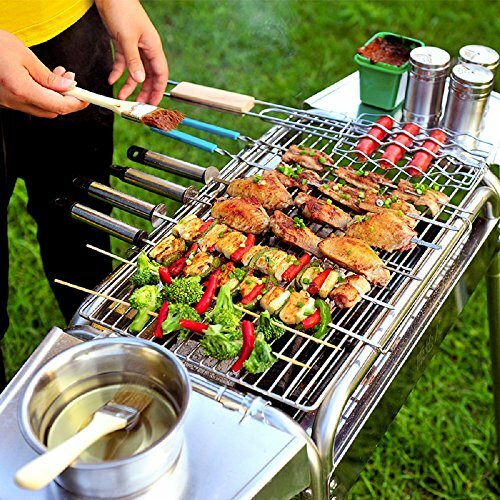 What we have today is the Miady Stainless Steel Foldable Grill and from all of the information we have collected, it’s one of the best foldable grills you can find for under $200. Starting out, we really like how it comes with 20 different BBQ tools. You have grill meshes, a removable sink, skewers, tons, spice bottles, grill pan, cleaning brush, mesh handle, storage basket and more. Almost every tool you need in order to grill, you can find it in this set. Foldable grills are great for carrying with you. This one right here is easy to transport and it isn’t large, so you can place it almost anywhere. To be exact, it measures 29” x 13” and it is perfect for supplying up to 10 people with food. It also comes with a nice storage bag, which fits the folded grill perfectly and makes it easier to carry around. All you have to do is unfold the stand and assemble it (this will only take a minute of your time). In the end, since it’s made of stainless steel material, you’ll find that it is super easy to clean. Looking at the Weber Jumbo, we see that the popular classic Weber kettle has gotten a nice update. The new Weber Jumbo Joe 22” charcoal grill has a large cooking surface, making it perfect for cooking for both large and small groups. Since there’s a plated-steel cooking grate, the food will be seared and super delicious. This grill has a heat-shield lid handle and a lid hook, which are nice features. On the side, there’s a hook where you place the lid. This way, you don’t have to set it on the ground. There are holes located at the base, so you can sweep the cooled ashes into the ash catcher when you’re done grilling. This grill has a 22” cooking area – that’s 363 square inches. From time to time, you’ll want to move your grill around, especially if you like to take it out with you. For this reason, the durable all-weather wheels will come in handy. The aluminum rust-resistant ash catcher makes it easy to clean up. 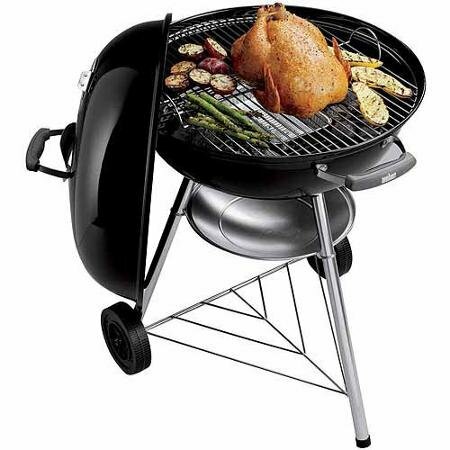 The grill has a rust-resistant aluminum lid damper so that you can adjust the heat. Inside the grill lid, there’s a lid lock. Last on our list of the top grills for under $200 is the NutriChef Charcoal Grill and it comes to you at a nice compact size of 13.4” x 13.4” x 8.7” and only weighs 11.3 pounds, making it perfect for outdoor grilling. This stunning grill features a nice battery operated fan built-in and it does an amazing job at cooking. It makes it so that the heat is blown directly on the meat. This grill is built in a manner so that the grease doesn’t drop into the charcoal, which means there isn’t as much smoke. Even if you have no experience with assembling things, you shouldn’t have any problems putting this one together. The NutriChef grill will cook some of the best food you’ve ever had. 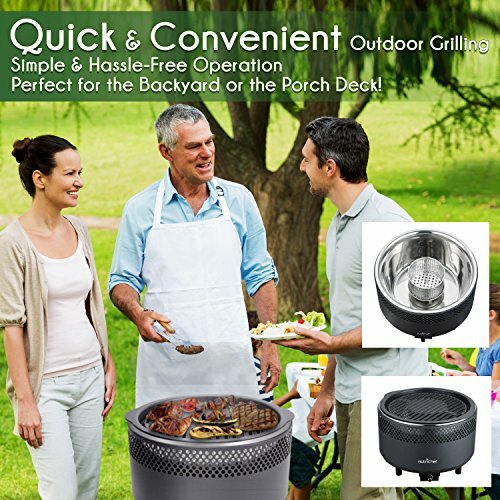 It’s perfect for those that are looking for a quick and convenient way of grilling. You can adjust the speed on the fan so that you can control the amount of air that is in the stove. Since the heat coming out of the stove is being used to directly cook and roast anything on the grill, it saves time and energy. So there you have it, the best grills we can find for under $200. It’s hard for us to choose the best out of this list because they’re all really good. If you’re looking for something fancy that will surprise all of your guests at your next backyard BBQ, then we recommend the NutriChef grill. However, if you’re looking for something that is capable of handling a large number of guests, then the Original Po’ Mans Grill would be the most suitable option.